The Albatros C.V was a German military reconnaissance aircraft which saw service during World War I. 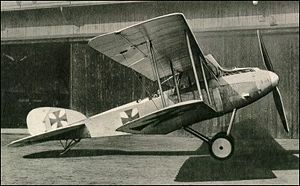 The C.V was Albatros Flugzeugwerke's first revision of their B- and C-type reconnaissance aircraft since Ernst Heinkel left the firm for Hansa-Brandenburg. While retaining the same basic layout as the Heinkel-designed aircraft, the C.V featured considerably refined streamlining. The forward fuselage was skinned in sheet metal and a neat, rounded spinner covered the propeller boss. Power was provided by the new Mercedes D.IV, a geared eight-cylinder engine. The initial production version, designated C.V/16, suffered from heavy control forces and inadequate engine cooling. Albatros therefore produced the C.V/17 with a new lower wing, as well as balanced ailerons and elevators. The fuselage-mounted radiators were replaced by a single flush radiator in the upper wing. These changes improved both handling qualities and engine cooling, but the downfall of the C.V was the unreliable Mercedes D.IV engine, which suffered from chronic crankshaft failures. The C.V was therefore replaced in production by the Albatros C.VII. Original design with radiators on fuselage sides. Revised aircraft with radiator on upper wing, and redesigned lower wing. Grosz, Peter M. (2002). Windsock Datafile 81 Albatros C.V. Berkhamsted: Albatros Productions Ltd..